As you delve into the wonderful world of breads, you may be running into new baking terms and words that confuse you. So I am adding the basic ones here (in no particular order) as a quick and hopefully useful reference. This list will be added to at any time I run across a new unfamiliar term or people ask me. Autolyse, pronounced “auto-leez”, is a period of rest allowed for dough to relax and hydrate. After the initial mixing of flour, water and (usually) yeast to incorporation, the dough is covered and allowed to rest, typically from 20 to 60 minutes. This rest period allows for better absorption of water and lets the gluten and starches expand and align, in effect beginning the dough development before any further mixing or kneading is given. Once the autolyse period is complete, the remaining ingredients (i.e. salt) are added and the final mix is given. This is also the basis for the “Bread in Five Minutes” or “no knead” process; the dough is made and allowed to sit in the refrigerator for several days and you pull a portion out as needed. As it sits, it automatically develops the gluten, albeit much much slower than by kneading or Stretch & Folds. This term refers to the period of rest where the leavening agent(s) in the dough are allowed to expand. The word refers to “proving” that the yeast or sourdough is active enough for the bread to rise. There are typically two stages: “bulk proofing” where the dough first rises while in bulk form regardless how many final loaves it may later be divided into, then “final proofing” which is the rising period after the dough has been divided and shaped into its loaf, batard, ball or other final shape. There is also a short, 5 to 10 minute “rest” period given the dough pieces once the bulk dough has been divided but before the pieces are shaped. This rest allows the dough to relax and shape easier. This is simply a French term referring to sourdough starter. A “pain au levain” is French for sourdough bread, as distinct from a bread made with commercial yeast. You may sometimes see this term applied to the middle-step sourdough that is built up from the Mother Starter and then added to the final dough mix. The Mother Starter is the “go to” sourdough starter from which you would then cultivate new batches for each baking session. It is always maintained, typically (for occasional home bakers) it is kept in the refrigerator and fed weekly. In my kitchen, it is never completely used up so that I retain at least a couple of tablespoons to grow more “mother” starter. Some recipes tell you to use the mother in building the dough, then keep some of the now built up bulk starter and turn it back into your mother. I don’t do it that way for the very real possibility that one day I’ll forget to “keep some back” and bake the whole thing, loosing my starter in the process. Yes, it happens even to experienced bakers. So instead I always use a “discard” from a feed to build up the required dough starter. It works precisely the same without the risk of baking your mother by accident. And you don’t want to bake your mother, right? This is also referred to as a “chef starter” or simply “starter“. And in my house, it has also been referred to, over time, as Audrey, Carl and, currently, PJ. Yes, my starters are given names. No, I’m not the only one with a named starter (in cases you were wondering). This is looked at in details (with videos even!) on it’s own page. It’s a different way of working the gluten in the dough that replaces kneading. That’s right, you don’t need to pound the dough for ages on end. Unless you like to; some people find it relaxing and therapeutic. This is a test to see if you’ve kneaded the dough long enough to develop the gluten strands adequately. 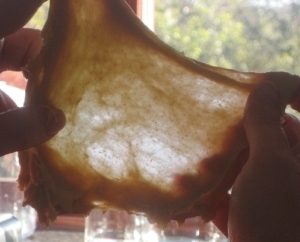 Simply grab a small chunk of the dough and stretch it out so you have a very, very thin sheet that, if held up to light, is nearly translucent with visible gluten webbing. If you can stretch the dough this thin without having it breaking or getting holes, your dough is well developed. If you get holes before you can get the sheet translucent, you need a little more kneading or stretching time. Check again after another 5 minutes of kneading or after another stretch. You may also find that allowing the dough to simply rest or Autolyse (see above) will allow the gluten to develop properly on their own. Some doughs made with other types of flour such as rye will have real issues getting a good windowpane as they do not contain the amount of gluten found in wheat flour. Lastly, some recipes require the dough to NOT be taken to full gluten development so as to get a softer dough that has a bit less “chew” or that will get further mixing in another step. In other words, you usually want to get good wondowpaning but there are exceptions. Grigne is a french word meaning smile or grin. A slashing technique that creates a more horizontal cut under the dough’s surface. As the bread bakes, the cut remains covered a little longer, allowing it to expand more before it bakes. This is also referred to as “ears” since the flap created eventually curls up and protrudes a little. Not only do “ears” or grigne help the bread expand while baking (called oven spring) but they also give a pleasant ‘artisanal’ appearance. The slightly more baked edge add to the flavour of the bread as does the baked wheat of the crust which is usually a fair part of the the whole bread’s flavour. A lean bread is one made with the basic bread ingredients of flour, water, salt and leavening (i.e. sourdough starter or instant yeast) although there are also unleavened breads that fall into this category, such as matzo. A lean bread can also have extra items such as herbs, sliced olives, grains & seeds, raisins, etc. as these are not specifically part of the dough itself. A bread is considered “enriched” when ingredients are added beyond the lean dough ingredients. Adding oil, milk, butter, sugar, honey, molasses, egg and so forth is considered “enriched” bread as these modify the dough structure considerably. These will affect things like rising ability, gluten structure and development, softness of the crumb, etc.. They do more than simply change the taste of the bread. On the other hand, adding herbs, grains or seeds like sunflower or extras like raising or olives does not specifically change the dough composition; they are merely flavour/texture additions and are often referred to as inclusions. This refers to a method more than the composition of the bread. A straight dough is where all basic ingredients are placed “straight into” a bowl then mixed into a dough. The specific ingredients are not really relevant to the definition. A straight dough may be easier defined by what it is not: it does not make use of a pre-ferment or sponge. A Straight dough is therefore a simple dough: mix, bulk ferment, divide and shape, final proof, bake. A straight dough will generally be one that uses a commercial yeast as this can be added directly to the bowl with the other ingredients. The opposite of a Straight dough: it uses some manner of preferment, whether that is a pâte fermenté, sponge, biga, poolish, sourdough starter and so forth. A preferment allows the flour to develop flavour over time by pre-wetting some or all of the flour in the recipe, sometimes with a portion of the yeast as well. Once the sponge or pre-ferment part is completed, it is added to the particular bread’s ingredients, making it a two-stage process. “Mise en Place”, pronounced “meeze awn plass”, is a French term that simply means “Put in place”. It refers to the setting out of your required ingredients, all measured and ready, before you start building your bread (or whatever you’re baking or cooking). So you’d go through your recipe and weigh out your flour, water, butter, salt, yeast and so forth ahead of time and make sure you aren’t short of anything and everything is right there for you. If you have a lot of ingredients that need to go in a set order, its a good idea to also arrange your little containers in the same fashion. You’ve seen this on a million cooking shows, the host always has everything ready and pre-measured and conveniently laid out in front of her/him. Why do it? To avoid surprises mid-baking and the potential of missing an ingredient if you are in the habit of scooping or spooning out as you go along. Did you add the sugar already? Did you add all three teaspoons or just two? Did you forget to put in your salt? If the salt is still on the counter then it’s easy to see you did not. If the little salt bowl is sitting there empty, it’s easy to see you did. And trust me (you can probably figure out how I know), dough without salt tastes really pretty “blech”, but the salt also controls the yeast a good deal; you’ll leave your (unknowingly) salt-free dough to proof for an hour and come back to a giant ball of dough… that will taste “bleh” if you bake it. Likewise, double the salt will cause the yeast to slow right down and leave your dough a small lump of quite inactive stuff PLUS it will taste just too darn salty when you eat it. Setting up your Mise en Place also lets you confirm you do in fact have a half cup of buttermilk so you don’t go to the fridge and suddenly realize you need to rush to the store when you’re halfway into mixing the dough. All in all, it’s a simple way to be prepared so you can focus on simply putting your dough together. “But it just makes more dishes!” Yeah, a bit. The dry ingredient bowls aren’t hard to clean and the wet ones are done with a quick scrub. It’s just part of being prepared and organized and a couple more little bowls in the sink or dishwasher won’t hurt, where forgetting or mis-measuring a key ingredient or two definitely will. Not visible in the above picture but just as important in the Mise en Place: equipment and time. A recipe calls for a particular procedure and a certain amount of time, start to finish. Do you have the required equipment? Have you planned the time line to not coincide with dinner or dashing off to work? Will the results be the same if you substitute this pot for that container? Might you need to do some adjustment to compensate for faster/slower cooking time due to the thinner/thicker/different material? If you have to set things aside, is there room in the fridge to hold everything while you are out for a couple of hours? Will chilling impede anything? These aspects are just as important as the laying out of the ingredients. There are three standard yeasted pre-ferments used in baking: Pâte Fermenté, Poolish and Biga. Although their compositions are different, they all aim to improve the taste of the bread by allowing a portion of the dough to age and develop it’s flavour before the main dough is built. The reason these are built separately and the actual bread dough isn’t simply left to age is that by making a batch of pre-ferment ahead of time, the final product can be added to numerous types of bread without having four or five different doughs sitting about for many hours fermenting. In a bakery, this would grind production to a halt. Because adding just a small portion of pre-ferment to a loaf can greatly improve the bread’s taste, it’s also an easy and economical way to make a lot of better flavoured breads. Well developed dough also makes bread more digestible. Pronounced “paw-tt fair-mahn-tay”, this French term translates as “fermented dough” and is a sponge dough method of creating a more flavourful bread by allowing a portion of the final dough to rest for several hours ahead of time, sometimes refrigerated overnight to slow yeast activity. Typically this simple lean dough is made up of water, flour, yeast and salt, which is allowed to develop for 12 to 16 hours. Or it can be, as the original term indicated, “already fermented dough” saved from the previous day’s bake, something a bakery that produces bread each day can carry over easily. For home bakers, not so much, so it’s simple enough to create it as needed the day before.Pâte Fermentée is usually the only pre-ferment where you’ll find salt included since finished bread dough kept from the previous day’s batch would have salt in it. Unlike Pâte Fermentée, Poolish has a definite ratio of ingredients, mainly that it is made up of 50% flour and 50% water (therefore 100% hydration) plus a very tiny portion of yeast, .08 to 1%. It is therefore more of a batter consistency. The name “poolish” is derived from the immigrant Polish bakers who introduced the method to their French counterparts. A Poolish normally has no salt. Here is master baker Wayne Caddy making and describing a poolish (first 5 minutes) as well as instructions for making traditional French baguettes. Biga, pronounced “Bee-gah”, is an Italian term for a pre-ferment. Unlike poolish, its hydration level is variable and can be from 50% to 99%; at 100%, it is essentially a poolish. And like the poolish, it’s yeast quantity is 0.8 to 1% . It typically contains no salt. As noted, the Pâte Fermentée is “officially” just some of the previous day’s dough kept back for the next day’s bread. As such, this dough could just as easily have been baked as a loaf so it by default would contain the standard amount of salt in that bread recipe. During the cooler parts of the year, the kitchen isn’t normally terribly hot and the yeast is kept in check by the moderate temperature. In summer, however, when the kitchen is running in the higher 80’s F (27-30ºC) the yeast can get pretty darn active. Here’s where you might want to add a bit of salt to slow down the yeast and keep your pre-ferment – and here’ we’ll also include sourdough pre-ferment – from either exploding out of it’s container or turning to a liquid paste – the yeast eats all the starch and then you’re left with a big bowl of goo. Adding a bit of salt to your pre-ferment keeps the yeast from being overly active which balances against the heat which makes it more active. You could add about 0.2% to 2% of your pre-ferment’s flour weight (adjust to a bit less if it’s only “rather warm” instead of “stinking hot” in the kitchen); just be sure to adjust the salt in the final dough to compensate for the salt you’re adding here. Simple trick: measure out your final dough’s salt and take your pre-ferment’s salt out of that. Flaky dough or mealy pie dough is made using the exact same ingredients, the difference is in the size of the fat bits, the fat being either butter (unsalted) or shortening or perhaps a combination of the two. Generally, a flaky crust is used for the top of a pie while the bottom is a mealy crust. This may make more sense in a bakery situation where it is logical to make and use two types of pie dough. For a home baker, it may be simpler to decide which style works best with your pie filling, liquid or thick, and use one or the other. In “flaky dough” you want the fat bits to be about pea sized, this will give a flaky crust as the larger fat bits melt, separating the flour into layers. This makes for a lovely, visually appealing top crust. In “mealy dough” the fat bits are mixed until they are very, very small and dispersed evenly through the flour. When these melt, they make a more even texture (not flaky) crust. The benefit is that this dough is less prone to absorbing liquid from the pie’s content such as fruit or other very wet filling and therefore less likely to give you a soggy-bottom pie. Something like a custard or frangipan filling which is thicker would not necessarily require mealy dough though it will still work great. Discovered your blog following your comments on Sally’s post. I absolutely LOVE how you have included the, Bread Baking Terms and Definitions. No matter how many times I read them I eventually need a refresher course! I’ll be back to your blog to savor your many wonders. I wish you continued success and will look forward to seeing where your next bread baking challenge leads. As for me….I have alot of catching up to do with the BBA Challenge, but I look forward to each and every loaf. Kudos to you for a job well done! 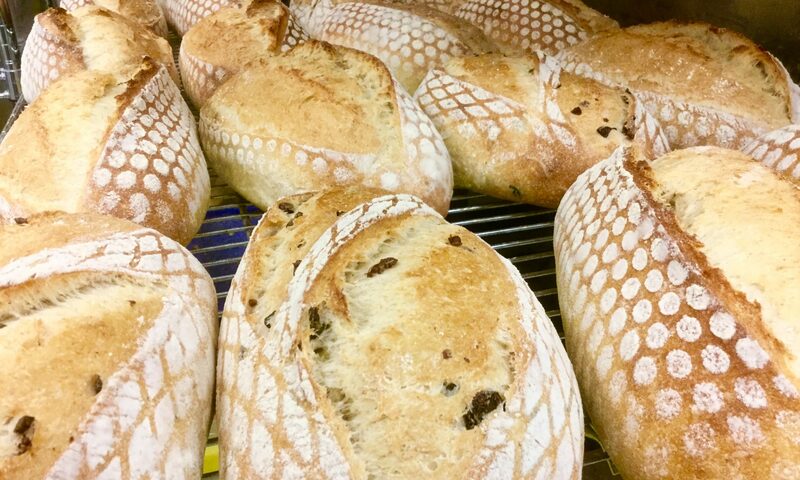 .-= Margie’s latest blog post: The Bread Baker’s Apprentice, Marbled Rye =-. this is great information, but I have a question. Have you heard of ethel? I ran into a recipe that calls for this ingredient. its for a bread. Well, that’s a stumper, for sure. I’ve no idea what this might be and seeing as it call for 18 oz of it, compared to 132 oz in total flour, that’s about 13% which is hardly insignificant. A quick googlage of “ethel bread recipe” got lots of hits for Lucy and Ethel hijinks or aunty Ethel’s old recipe but nothing for ethel as an ingredient. Hunting for “EDDIES WHOLE WHEAT MULTI-GRAIN SOURDOUGH” (and even “miltigrain”) came up empty. I’m going to take a stab and say perhaps it’s in reference to a brand name of something specific to an area, perhaps. But what it could be I cannot fathom even a guess. Thing is, the recipe is written in a rather professional and modern form, calling for stretch and folds, specific steaming instructions – indicating use in a deck oven – so it’s being made commercially. Perhaps it’s an in-house ingredient name from a supplier. Thank you so much for trying, I pretty much did the same search as you. So I received a lot of these recipes from a friend. And most of the recipes that are labeled with the word “sour” has Ethel in them. I think that this could be a starter named after Ethel? In a concentrated form or a old living creature. What do you think, I look for to your reply. Actually, that makes a lot of sense. If it were at my bakery, we would say “200g of PJ” or “175g of Ana” which would mean 200g of white or 150g of rye starter. Everyone would know what that meant. But not to someone unfamiliar with our particular pets or who was handed a recipe. So I think you’ve hit the mark there. And at 13%, that’s an acceptable amount of starter. This was a very helpful page! Thanks so much! I’ve got a 100% spelt sourdough going at the moment, and used a very watery preferment. I was interested in what it might be called. It was 150 g flour and 150 g water, with about 20 g starter, so I think that would fall under the category of a Poolish. It turned out very watery. Later I look forward to trying your recipe for bagels. You would be correct to call the preferment you made a Poolish (pronounced “poo-leesh”; it’s french) but only if it was seeded with regular commercial yeast (Instant, Active or Fresh). As you started it with a small bit of sourdough starter, however, it’s considered a “levain”. This then becomes the leavening agent for your dough. And if you only use this and no added commercial yeast, the process takes more time as a sourdough dough is much slower to proof than a commercial yeast one. More time is a good thing, of course. A poolish’s main goal is to pre-ferment a good portion of your final dough for better taste and digestibility, not to act as the primary leavening agent (although it does add some leavening power). It is then typically added to a dough, along with more of the commercial yeast. It is unlikely this dough would also use sourdough starter in any way. In either case, the end result is much better bread than a straight mixed commercial yeast bread that could go from start to going into the oven in about 4 or 5 hours. Now I’d also add that you refer to the mix as “watery” a couple of times. At 100% hydration by weight, it should be like a thick pancake batter, not watery (running off a spoon easily). The only circumstance I’d see that hydration of starter be “watery” would be if it had sat too long and the critters had eaten through all your flour, breaking it right down to a runny paste. But that would require letting them sit out, unrefreshed, at room temp for a couple of days. And you would quite possibly see a layer of hootch on top. Let us know how the bagels turn out! Ok, you’ve got me there. This is the first time I’ve heard the term “flaky flour” to describe a TYPE of flour. 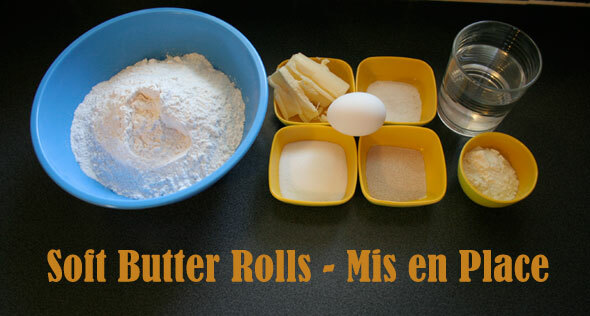 Searching with the googles, all that comes up are countless instances of the two words as descriptors of a third word or term, such as “flaky flour tortilla”, “flaky flour crust” or “flaky flour dough” and so forth. In all those cases, either flaky or flour could be removed and the idea would remain useful, such as “flaky dough” or “flour dough”. So basically, it’s saying that the item (dough, crust, tortilla, bread, etc..) is both flaky in texture and made with (wheat) flour instead of some other type of ground seed. I was unable to locate any mention of a style or type of flour called “flaky flour”. Perhaps it’s a local flour brand, such as flour produced by the Flaky company? Maybe it’s a local term referring to flour that is good for making flaky items (i.e. lower in protein so All Purpose of Pastry flour). I dunno, I’m just left to come up with possible explanations here. If any other reader DOES know of such a style of flour, please post that information as a reply. We’d like to solve this mystery!